I'm a bioengineer and neuroscientist interested in how dynamic environmental signals, such as speech, are encoded, decoded and integrated in the typical and atypical human brain. In particular, I'm interested in how machine learning techniques can be used to emulate information processing in the brain and further our understanding of sensory function and dysfunction. 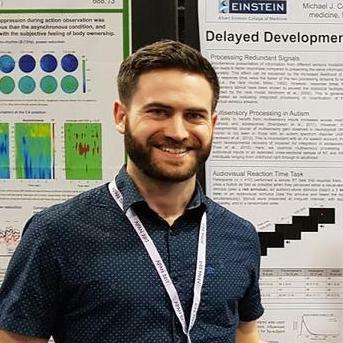 I'm currently working as a postdoctoral researcher at the Cognitive Neurophysiology Laboratory at Albert Einstein College of Medicine, investigating the neural basis of impaired multisensory processing in children with autism. Before moving to Einstein, I completed a PhD in Neural Engineering in the Lalor Lab at Trinity Centre for Bioengineering. My dissertation work led to the conception of a novel methodological framework for studying natural audiovisual speech processing and the development of a MATLAB-based system identification toolbox (mTRF Toolbox) for decoding stimulus information from neural signals. You can contact me via email at michael.crosse [at] einstein [dot] yu [dot] edu, or using the links below.